Tired of looking for the best fishing spot but always coming up short? It’s time to get a professional fish finder that can search the depths, far further than what human eyes can see. 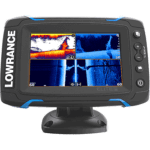 There are a massive number of these devices on the market, but today we’ll be looking at the Lowrance Elite TI line. There are four different models here in varying sizes that each give you some amazing features. Let’s look at what the Elite TI line offers and see if it’s good for your needs. As stated above, the Elite TI line comes with four different models. The only major difference between them is their display size. You can choose a 5-inch, 7-inch, 9-inch or 12-inch screen, each with a resolution of 480-by-800 pixels, which is considerably clear and great for providing sonar images. The display has WVGA color, ensuring that everything looks nice and bright, along with LCD lights to make it easy to see regardless of time, set up to 1,200 nits of brightness. The screen is also resistant to glares so that you can see it during the brightest days and darkest nights. You will find that the display is balanced and keeps an even border around the entire unit, keeping it safe from dings while being aesthetically pleasing. All the buttons you need are on the right, ensuring that you can easily change between different views. Speaking of views, it’s possible to have three different views at once with different types of imaging being applied to each. The touchscreen allows you to select options from the screen itself. The Elite TI comes with Bluetooth and wireless connectivity. You might be wondering if this is a good thing because why would a fish finder need a wireless connection? All GPS units, and devices in general, receive software updates. Many units must be connected to a computer in order to receive these updates, but the Elite TI is capable of downloading and installing the newest software package without ever leaving the water. Another benefit of this is that you can instantly download new Genesis Insight maps whenever you need them. You’ll love this if you ever go to new waters or just want to try a different area. CHIRP imaging has been around for a few years, but it was first used by the military for its sonar image clarity. Unlike a traditional sonar, which bounces waves at once frequency off objects, CHIRP allows you to bounce multiple frequencies off objects to produce the clearest image possible. This feature comes standard with all of the Elite TI fish finders, so you can enjoy its benefits regardless of which model you choose. This ensures that you can easily see what’s under your boat so that you know when it’s time to cast your line. It works at low, medium and high frequencies of 83, 200, 455 and 800kHz. ing to interpret the little arches and bumps as either fish or other objects. While an experienced fisherman can easily tell the difference, no one likes doing the work of interpreting the symbols (especially if you get it wrong). The Automatic Fish Symbol ID makes this work so much easier. The fish finder will automatically change the image so that you see little fish symbols. This makes it much easier to find fish, see their size and determine their speed and direction. All of this manual work is taken out so that you can set your line and relax. Something that might confuse some people is the StructureScan and DownScan features. That’s only because both features often have different names with other fish finders. StructureScan is the same as side-imaging, meaning that it gives you a 180-degree field-of-view around your boat. This gives you a much wider image of the sides of your boat, ensuring that you see everything around you. DownScan is more commonly known as down-imaging. This is a great feature that gives you a POV look under the water. Unlike other views, which display everything as little smudges in the sonar, DownScan produces a much clearer image of the objects and creatures down there. It lets you see things like you’re a fish, which makes it so much easier to find what you’re looking for. If you’re going in familiar waters or along a common route, then you may not see why a GPS is useful. However, it becomes a huge asset when you go somewhere new or unfamiliar. Not only does it track your speed, but it will help you determine where you are and how to get back home. The GPS allows you to program up to 100 routes, giving you more than enough for your needs. You can also store up to 3,000 waypoints. You should have no problem programming all of your routes and spots for your fishing adventures. Another useful feature included on all Elite TI models is the TrackBack mode. This allows you to go back and compare different fish populations based on your recorded data. You can easily use this to find good areas that you’d like to visit again. This will ensure that you immediately find the fish so that you can start casting off, rather than going around in circles and trying to find a good area. Transmit power here is a fairly standard 500W, which is common for most fish finders of this size and price point. You get a maximum depth of 1,000 feet, which is among the higher end of normal for similar fish finders, and it can use various frequencies to help you discover where fish are. You can scan in 50, 83, 200, 455 and 800 kHz, based on what type of scan you’re doing and your preferred options. 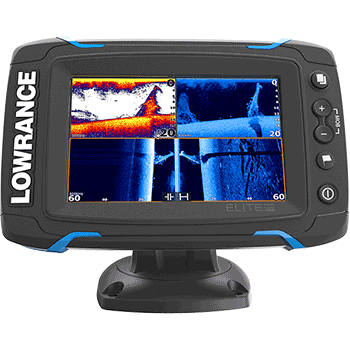 If you’re looking for a functional and feature-rich fish finder, then the Lowrance Elite TI definitely fits the bill. From helping you determine which signals are or are not fish, to a TrackBack feature, along with various types of scans and imaging types, you’ll have no problem finding the right areas to fish. It also comes in various display sizes, ensuring that you get the right one for your needs. The most popular would be the 7-inch and 9-inch, but there’s absolutely nothing wrong with going higher or lower with the 5-inch and 12-inch. In general, this fish finder deserves top billing and is suitable for both amateur and professional fishermen. No matter what you use it for, the Elite TI series will be right there with you, helping you locate the best spots instead of wasting your time on discovering what lurks under the water.